Here is a lounge song performed by the great Romanian jazz singer Aura Urziceanu, chosen to illustrate the beauty of cult actress Veronica Carlson. Veronica Carlson (born in 1944 in Yorkshire, England) is an English model and actress, famous for her roles in Hammer horror films. 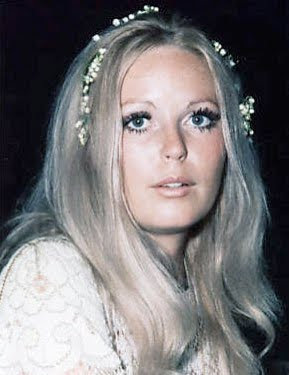 Born as Veronica Mary Glazer, Veronica Carlson spent most of her childhood in Germany where her father was stationed. In her mid-twenties, Veronica played a few minor parts in movies and television programmes. James Carreras, the boss of Hammer Films, saw one of her photographs in a newspaper and offered her a role opposite Christopher Lee in "Dracula Has Risen from the Grave" (1968). She played in two other Hammer Horror films, "Frankenstein Must Be Destroyed" (1969) and "The Horror of Frankenstein" (1970). She also appeared in the Randall and Hopkirk (Deceased) episode "The Ghost Who Saved the Bank at Monte Carlo" in 1969 and an episode of The Saint ("The Man who Gambled with Life") with Roger Moore. Veronica Carlson went into semi-retirement after marrying and moving to U.S. She now lives in South Carolina with her husband and three children and is a professional painter.